The beauty of wood floors is that they are both timeless and stylish, adding a touch of class and a warm glow to any room. They are easy to dress up with an ornamental rug or beautiful to show uncovered in all their glory. There are plenty of woods to choose from as well, which will help to determine the width of the cut as well as the exact color that you will get from the flooring. For a warmer, almost golden glow, take a look at an Ash floor. 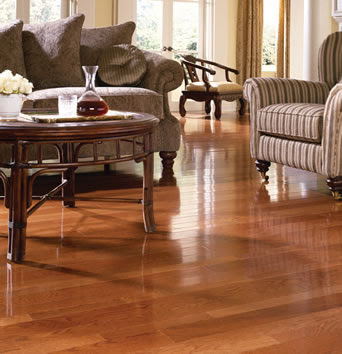 If you want a more rich look, American Cherry flooring is a warm reddish brown that will have you admiring the floor for hours. Birch is a very pale shade, but has variations between light and slightly darker that draw the eye. If you want your floor to have a color all its own, then check out a sample of Brazilian Cherry. The bright red of the tree is stunning to say the least. Eastern Pine is a beautiful golden color that warms up a room nicely, but for the real variations in the grain you will want to take a look at Heart Pine. The swirling of the grain of this wood is breathtaking. Hard Maple is a pale shade that sets a wonderful stage for bold furniture and d้cor, and would look lovely in a gallery style room. Hickory looks wonderful with golden wood and darker knots, and would fit in well with cabin style decor. Red Oak has a reddish tint to the rich wood, and is full of the swirling of the grain. Mahogany is a dark red color, and is very consistent in the coloring. Sassafras is a warm color as well, showing an almost orange glow. Soft Maple is similar to the Hard Maple, but stains slightly better. Walnut is a gorgeous reddish color that is marbleized throughout, showing beautiful patterns. White Oak is also a warm golden color with lovely patterning to it. There are lots of color choices in hardwood flooring. To find the right shade for your project, the best strategy is to take a photo of your furniture to the flooring supplier. See what works best with your kind of furniture. If possible, get some samples of wood to take home. No matter what style of house or apartment you are decorating, hardwood floors will bring a timeless appeal and a new richness of color to your surroundings.